Thank you very much, Stephen (Chairman of the Hong Kong General Chamber of Commerce, Mr Stephen Ng), for those kind remarks. First of all, it gives me great pleasure to join so many people, 1,400 friends from the business community, at this joint business community lunch. I understand that this is a long-held tradition after the Policy Address, for the chambers in Hong Kong, both local and international, and also Mainland enterprises' chambers in Hong Kong, to join hands and organise a business luncheon in honour of the Chief Executive for him or her to talk about the Policy Address. I was just wondering why, as the Chief Secretary for Administration, I was never invited to come and take a seat to listen to what my boss had to say about his Policy Address, so every year I could only watch TV broadcast, and I got the impression that this luncheon took place in a hotel. So when I realised only very lately that it's going to be in the Grand Hall, I was a bit worried, because although I have spoken in this venue a couple of times but never was for a luncheon in which later on I'm subject to some grilling from the floor. My worry is not to answer the question. My worry is whether I can listen attentively to those questions in such a big venue. But anyway, thank you very much for this occasion, and special thanks go to the Hong Kong General Chamber of Commerce for taking the lead to organise this event and for the very active participation by all of you. Time is relatively short. I have been given 15 minutes to speak and then another 15 minutes to answer questions, so I cannot give you a comprehensive account of my Policy Address because that will take at least three hours to do it. So I will focus on the economy, because this is a gathering of business people and what I perceive as the role of the Government. But let's start with some figures. I understand that very recently I've got myself into trouble by this figure of 800,000. But I will not shy away from difficulties. As you know, I am a person who likes to rise to the challenge and to confront difficulties in front of me. So, I want to share with you some figures. The economy is doing well so far this year. In the first half of this year we have recorded a 4 per cent real growth year- on-year, which is visibly higher than the 2 per cent in 2016, and it is expected to exceed 3.5 per cent on a whole-year basis. I always like what Paul Chan, my Financial Secretary said, when he referred to this “likely to exceed 3.5 per cent”, he has this Chinese phrase “已無懸念” – in other words, there is no doubt that it will exceed 3.5 per cent; just how much excess we'll have to await Paul to tell you when his next Budget comes. This exceeding 3.5 per cent real growth in a year is the fastest growth since the year 2011 and higher than the average trend growth rate of 3.3 per cent since 1997. So, that's a very good piece of news. Second figure is inflation. Business people are always very worried about inflation. Inflation has remained tame so far in the first nine months averaging 1.7 per cent compared to 2.3 percent in 2016. Exports of goods and services are doing extremely well, picked up significantly, increasing by 6.5 per cent year-on-year in the first half of this year compared to a modest 0.9 per cent in 2016, with exports to Asian markets providing the main growth impetus. So you understand why this Government is putting a lot of attention on the ASEAN region because Asia is going to be another strong impetus for growth in the coming years. Now, domestically, retail sales volume, after falling consecutively since August 2015, resumed growth in March this year and picked up further more recently with a year-on-year growth of 3.9 per cent for the months of July and August. I'm sure you will notice some of the positive sentiments amongst consumers, both local people as well as visitors. Coming to visitors, tourist arrivals, after falling for two consecutive years also rebounded, registering an increase of 2.2 per cent for the first nine months from both Mainland and non-Mainland markets. Worthy to note was an even higher growth in overnight arrivals of 4.5 per cent. The number of overseas and Mainland companies in Hong Kong has also risen. I notice that there are a lot of international chambers in the audience. 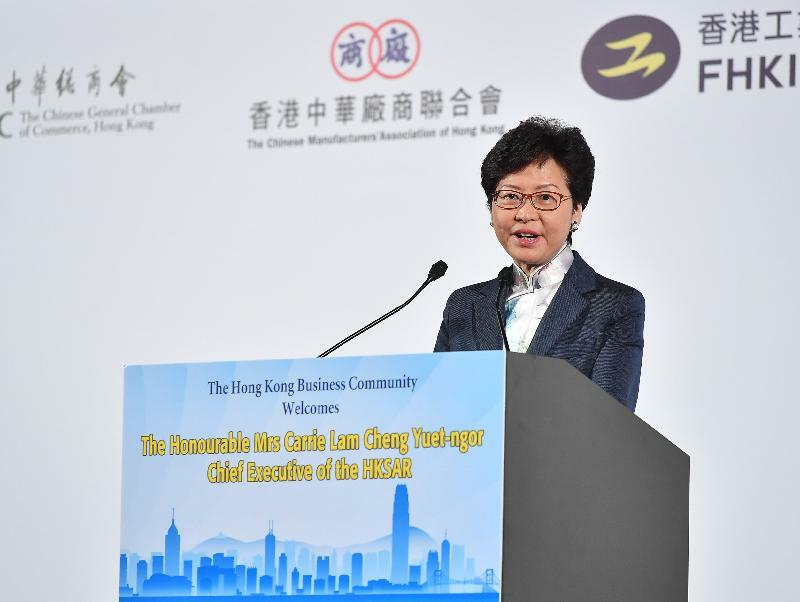 The latest survey by the Census and Statistics Department together with Invest Hong Kong indicated we now have 8,225 Mainland and overseas companies which have set up in Hong Kong, representing an increase of 3 per cent year-on-year. I'm very gratified to know in particular that those overseas and Mainland companies using Hong Kong as their regional headquarters have risen to 1,413, reversing the declining situation and registering an increase of 2.5 per cent over 2016. And for those of you who are anxious to know which country tops the league in terms of total number of overseas companies, the winner is here, Ambassador (Kuninori) Matsuda of Japan. Now, number of start-ups. This place is very welcoming for small enterprises, for people with strong entrepreneurial spirit, so number of start-ups now stood at 1,926, involving both local and foreign founders. It has surged 24 per cent year-on-year, and has almost doubled the situation in 2014. So, those are the very promising figures that I want to share with you, but not without worries. Let me quote another set of figures, which are concerns to many of us. Private residential prices continued to surge with a year-on-year increase of 18 per cent as at August 2017. Office rental, better, grew by a lesser extent at 5 per cent for all offices and 6 per cent for Grade A offices. But I'm sure you remember this land sale, with the Murray Road Car Park site sold at $23.28 billion, representing an overall AV of over half a million Hong Kong dollars per square metre. So the supply of Grade A offices remains very tight. Now, coming to tightness, the tight labour market tightened slightly further with unemployment rate at 3.1 per cent, signifying full employment. Indeed, private sector vacancies hovered around 70,000 and acute shortages were seen in residential care services, F&B services and accommodation services. Anecdotal evidence suggests that the acute shortage in construction sector has somewhat subsided, which may have something to do with LegCo filibustering. If you don't believe me, you ask Jeffrey Lam. In the 2016/2017 LegCo year, that is before the summer recess, public works projects at a total value of HK$71 billion put on the agenda of the Finance Committee could not be approved before members went on their summer holiday, so it is a delay of at least six to 12 months. Thanks to a modest labour force growth of 0.5 per cent year-on-year, latest projections project a plateau in labour force in 2019 to 2022 as compared to labour force peaking in 2018 based on previous projections a few years ago. When I was the Chairman of the Steering Committee on Population Policy, the then projection was by next year Hong Kong's labour force would peak and thereafter it would decline. Now it's a slightly better situation. Now, these two sets of “promising” and “worrying” figures, when put together, echo my key message to the people of Hong Kong contained in my maiden Policy Address. In the coming few years, Hong Kong is entering a period when opportunities and challenges co-exist. We must leverage our unique advantages under "One Country, Two Systems" and inject new and continuous impetus to Hong Kong's economy through a new proactive style of governance, strong commitment embodied in the new roles of the Government and a new fiscal philosophy to manage our finances wisely. Only by so doing and with the strong support from the Central Authorities will Hong Kong be able to seize the many opportunities available to us under the Belt and Road Initiative and the Guangdong-Hong Kong-Macao Bay Area development. Let me say at the outset, because Stephen mentioned about big market, small government and not vice versa, so let me say at the outset that a proactive government approach to economic development does not mean we are deviating from the free market principle. We will continue to respect the rules governing the economy and market operations and promote free trade. But doing all we could to raise Hong Kong's competitiveness is a duty of my Government. My Policy Address has contained a whole range of initiatives to boost our economic vibrancy through efforts in various areas. These areas include providing land, nurturing and recruiting talents, strengthening government-to-government business, giving clear policy directions, providing investment, enhancing business-friendly environment and offering tax concessions where justified. I do not wish to go into details of each of these areas, but will only wish to highlight three measures to illustrate that we are serious and determined and will not shy away from making difficult decisions. And, by the way, two of these three measures actually coincide with what Stephen has mentioned in his remarks. So it does prove that my thinking is now very aligned with the business community. First, right here we are in the Hong Kong Convention and Exhibition Centre (HKCEC). We all know that the convention and exhibition industry is crucial to Hong Kong as an international centre for trade and commerce. By attracting world-class and the most prestigious international conventions and exhibitions to Hong Kong, we have reinforced our position as an international hub. Many large-scale fairs and shows now organised in Hong Kong are the largest in Asia or even in the world, but the shortage of space is a pressing concern. In order to maintain our position in the convention and exhibition industry, we could no longer delay a decision on finding extra venues. We have concluded, and I have announced in my Policy Address that the new facilities should be built in the proximity of the existing Hong Kong Convention and Exhibition Centre, right here in Wan Chai. The new venue must be connected to and integrated with the existing HKCEC in order to maximise the benefits. We have therefore decided that we will demolish and redevelop the three government buildings opposite the HKCEC into a new wing that can be connected to and integrated with the existing HKCEC. We will take the opportunity to relocate the Harbour Road Fire Station and improve the traffic arrangements, particularly the pedestrian walkway network in the area. When completed, Wan Chai North will become a convention and exhibition hub not only for Hong Kong but also for Asia. Such a major project is clearly not without difficulties. Several new government office buildings and a new court complex will have to be built to decant the existing tenants. It will also take time. But unless we make up our mind and press ahead, we will not succeed and Hong Kong will lose the many opportunities in front of us. My second example is our determination for Hong Kong to catch up in the innovation and technology (I&T) race and to become an international innovation and technology hub. My Government will concurrently step up efforts in eight areas, namely dedicating more resources for R&D, nurturing a pool of talents, providing and promoting venture capital, building infrastructure, reviewing obsolete legislation, opening up data, updating government procurement and enhancing popular science education. I recognise that the window for us to catch up is small. 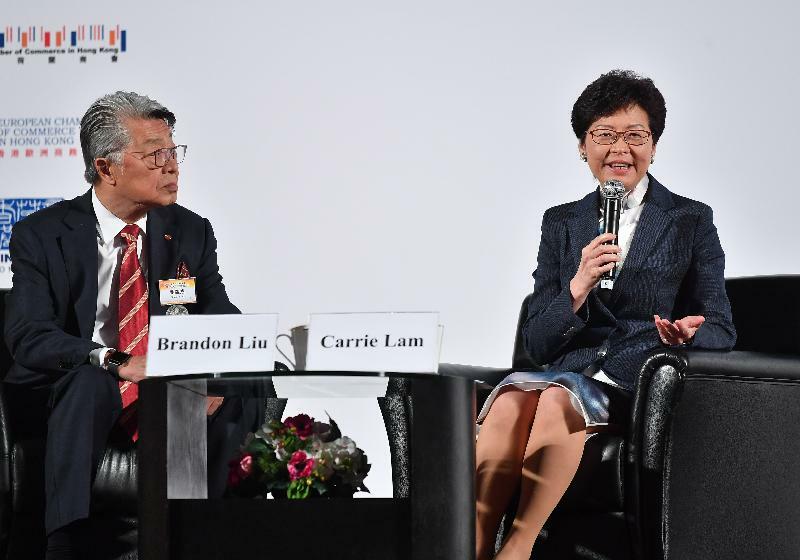 But opportunities are plenty, especially with the Guangdong-Hong Kong-Macao Bay Area and Hong Kong and Shenzhen joining hands to create an international I&T centre. We cannot afford to take small steps. We have set a goal to double the GDP expenditure on R&D from the current 0.73 per cent of GDP to 1.5 per cent within the current term of Government. I'm holding myself accountable for progress made by personally chairing an internal Steering Committee on Innovation and Technology to take forward these measures identified and steer collaboration amongst bureaux and departments. My third example, which naturally should be music to your ears, is our plans to reduce taxes. In order to further enhance the competitiveness of Hong Kong, we have demonstrated determination in our taxation policies. The Financial Services and the Treasury Bureau has made proposals on the two tax measures put forward in my Election Manifesto, with a rate of tax reduction even deeper than what I had proposed, and will strive to implement them within 2018, provided there is no LegCo filibustering. On the two-tiered profits tax system, the profits tax rate for the first $2 million of profits of enterprises will be lowered to 8.25 per cent. That is half of the standard profits tax rate instead of 10 per cent as proposed in my Manifesto. Profits above that amount will continue to be subject to the standard tax rate of 16.5 per cent. To ensure that the tax benefits will target SMEs, we will introduce restrictions such that each group of companies may only nominate one enterprise to benefit from a lower tax rate. To encourage research on R&D investment by enterprises, we propose that the first $2 million eligible R&D expenditure will enjoy 300 per cent tax deduction with the remainder at 200 per cent. This is likewise a more generous proposal than the single deduction rate of 200 per cent mentioned in my Manifesto. Ladies and gentlemen, I'll stop here to allow time for questions. But before I close, let me appeal to you all to have confidence in Hong Kong. Last weekend, I went to the annual Wine and Dine Festival at the New Central Harbourfront and officiated at the cross-harbour swim from the vantage point in Tsim Sha Tsui. Looking at both sides of the Victoria Harbour and under a clear blue sky – which happens to be my campaign colour and now the colour of my maiden Policy Address, I notice that this event has also used my clear blue sky colour as the backdrop – I feel so much attached to this city I call home. I talked to people, took selfies, and promised to be back next year. I suddenly realised that this is exactly what that succinct closing remark in my Policy Address envisions. Let us connect for hope and happiness. I wish to thank chambers again for putting together this business luncheon for me to talk about my policy vision, and if I may, I promise to be back next year.